This list consists of the top 50 songs that I like so far in 2016. The songs that I wanted to come on my radio while driving to and from work, on a road trip, or when I was just sitting at home. Note that not all songs may be “traditional country”. I listen to all genre’s of music, so I have no issues with country artists who play “non-traditional” country. To me…music is music. If I like it, I’m going to listen to it (and enjoy it). You probably heard some of these songs every hour (on the hour) on your local country station. Others may not have been played much (if at all) when they should have been, in my own, personal opinion. Also, while some of these songs may have come out in late 2015, and may have even landed a low spot on my wrap up of the year, they were ones that were predominantly played (if they made the radio) so far in the 2016 calendar year. And now, Without further ado, let’s get this party started with a three-way tie at #50. Well that’s it. My Top 50 of 2016…so far! Now here’s a blast from the past. Another country music group that I absolutely love. Heck, I’ve bought all their music. I’ve seen them in concert three times (here’s my review from a KRTY show in San Jose way back in 2009) and I’m absolutely stoked that they have some new music. Ladies and gentlemen…I bring you Trailer Choir! As background, Trailer Choir is a duo composed of vocalists Marc Fortney and Vinny Hickerson, known by their respective stage names Butter and Big Vinny (also known as Bigg Vinny and Bigg Vinny the Mack). At one time, the group was a trio with Crystal Hoyt. They originally signed to Show Dog Nashville, a label owned by Toby Keith, back in 2007. After recording “Off the Hillbilly Hook” for the soundtrack to Keith’s film Beer for My Horses, Trailer Choir charted the singles “What Would You Say“, “Rockin’ the Beer Gut” (the song that got me called into my son’s kindergarten class by his teacher because he was singing it during class!) and “Rollin’ Through the Sunshine” on the Billboard Hot Country Songs charts. These singles were followed by an EP, Off the Hillbilly Hook, and their full-length album, Tailgate. Hoyt departed the group in February 2011. In 2011, Hickerson entered the national spotlight when he participated on The Biggest Loser. While on the show he lost nearly 200 pounds, made the final four, and was the runner-up for the at-home prize. The show also aired his marriage proposal to girlfriend Lori Diaz, which took place at the Grand Ole Opry with none other than Thompson Square performing “Are You Gonna Kiss Me or Not”. Now, let’s get onto the music! Six years ago, I did an in depth review of “Tailgate”, which was one of my favorites of 2010. From the energetic “Shakin’ That Tailgate”, to classics such as “Rockin’ the Beer Gut”, “Off the Hillbilly Hook” and “Rollin’ Through the Sunshine”, the CD had that perfect mix of fun and sun! Now, Trailer Choir is back and better than ever. As part of the Average Joes Entertainment family, the band is ready to climb back up the charts and share their music with country music fans everywhere. Certainly, big things lay ahead for the boys. They are certainly taking that path with the release of their summer anthem “Ice Cold Summer“. Written by Hickerson, Fortney, Scott Martin Mills and Brandon Ray Tant, the songs tells the story of a hot summer day spent hanging out with friends, drinking some ice-cold beverages. Coca Cola, Dr. Pepper, MUG Root Beer and Lemonade I suppose, right? The new song certainly focuses on the simple pleasures in our lives, that’s for sure! I know there’s more that I could talk about here, but I don’t want to bore you with my words. Instead, I’ll let you check out some more of the band’s music for yourself. If you see Trailer Choir on the bill anytime soon, make sure you’re there early. You don’t want to miss your chance to see this band. I said it before and I’ll say it again: they have the type of show that will keep you on your feet from beginning to end! Also, make sure that you check them out on Facebook and follow them on Twitter at @TrailerChoir. Upcoming tour dates can be found here. Don’t forget to check out their music on iTunes. So what did I miss? Have you seen Trailer Choir live? What do you think of them? Please share your thoughts in the comments section below. Do You Know Trailer Choir? It’s a Wednesday morning and I just feel the need for playing some Trailer Choir. One of my all time favorite bands and they’ll be within two hours of here this weekend! King City, California!!! I’ve been to a lot of great country shows: Kenny Chesney, Toby Keith, Brooks & Dunn, Blake Shelton, Lady Antebellum, McBride, Trailer Choir, Keith Urban, Shania Twain and a WHOLE LOT MORE! I’ve been to a ton of shows at the Rodeo Club in San Jose, put on by local country station 95.3 KRTY. But this year’s show with Brad Paisley, Dierks Bentley and Jimmy Wayne has to rank up there near the top. I first saw Brad Paisley live at the KZLA Country Bash in Irvine, California, back in 2001 about a month after the terrorist attacks on America. Back then, Paisley was still an up and coming talent. Today, he is one of the best in the industry. The night started off with a short set by Jimmy Wayne. Too bad it was only 6 songs because I’m pretty sure that this guy is going to be huge. He has a stage presence that puts him at a much higher level than his billing and its shows as he plays the crowd during his entire set. After the show, I got the chance to meet him. He was really nice and took the time to sit and talk for a minute with each person during the meet and greet. The photo can be found below. Next on the bill was one of my favorites, Dierks Bentley. For most concerts, Dierks Bentley would be a headliner and he proved it during his set which include most of my favorites (how could you leave off my all-time favorite “Tryin’ to Stop Your Leavin'”). There was so much about his set that I loved. “Sideways” is a great song to start with because it really gets the crowd going. Others such as “How Am I Doin'”, “What Was I Thinkin'” and “Feel That Fire” were crowd favorites. Great music, great voice and, like Wayne, Bentley really played the audience. I love the way that he was able to mix in his standard party songs with his great ballads and he never lost touch with his emotion. This is clearly demonstrated in each song he performed during his one hour set. I’ll admit, I would have loved a little longer set but you can’t complain when you get nine of his best! I think if he had been the headliner, the set list would have included a few additional songs. The crowd was really into the set but I really enjoyed when he took the time to slow down a bit for “My Last Name”. Very emotional and showed his softer side. About 9:20, it was time for the main event of the evening: Brad Paisley. Paisley is an entertainer at heart and really knows how to put on a show. Multiple times during the show, he thanked the audience for coming out to show, knowing that we are in difficult economic times and still paid to see the performers that night. Yes, the show’s are pretty expensive, but I’ll continue to pay to see my favorite artists live. Paisley played all of his hits and the audience was eating out of his hands from the opening number “Start a Band” (minus Keith Urban of course). It was a great mix of old songs, and new. Ballads and rockers. And of course, lots of guitar solos. Paisley is an incredible guitarist who demonstrates his talent throughout. I loved the videos that played on the screen in the background throughout the show. Good stuff! Loved the parodies and everything. It really made the songs come to life even more. “Welcome to the Future”, Paisley’s latest hit was the opening song of a three song encore. This song has fast become my favorite song that Paisley has ever performed. Not only does it have a great beat and just makes you want to turn up the radio when it comes on, it has a great message of hope and making you realize that the future is here, now! During the encore, Paisley brought Wayne and Bentley back out for a great rendition of “Alcohol” which capped the night! , a great cover of Don Henley’s classic “Boys of Summer” was the final song of the evening, but seeing these three talented musicians on stage together was a real thrill, and a perfect song! If you ever get the chance to check out Brad Paisley (and Dierks Bentley and Jimmy Wayne) live, I suggest you do! It’s definitely a 5 star show! If I can get some video of the show up, I’ll be sure to do so! You can always check out my Facebook page which has the videos there. Seems like George Jones still fears change. The country music legend is speaking out against up and coming stars such as Carrie Underwood, Taylor Swift and others, saying that they need to leave country music and find a genre that better suits them. Yes, today’s country music isn’t the same as traditional country music, but what “The Possum” needs to learn is that people change, styles change and music changes. Sorry George. I’ve been a fan of both traditional and modern country music and if it reverts back, I think you’ll lose at least one fan (me). I enjoy a lot of the country songs on the radio today, but when I hear new music by George Strait, and even Alan Jackson lately, I have to turn the station. Their songs just don’t do anything for me anymore. These days, I’m more of a fan of singers such as Kenny Chesney, Billy Currington, Toby Keith and Brad Paisley and bands like Trailer Choir and Montgomery Gentry. These are artists who can reach across different genres of music and reach a larger audience. In Jones interview, he said that he had no intention of collaborating with any musician of another genre. We’ll see what happens! I have a lot of respect for Jones, but right now, he’s coming off like a grumpy old man. George Jones says he’s been robbed. Not of his personal belongings, but of something perhaps even more valuable: his role as a country singer. 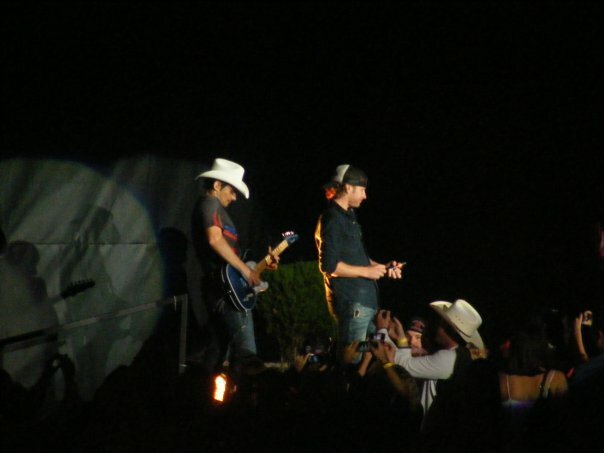 Brad Paisley, Dierks Bentley and Jimmy Wayne…Tonight in Mountain View! UPDATE: One of the BEST shows of the year. The set lists listed below are about 99% accurate. Dierks Bentley didn’t play “Trying to Stop Your Leaving. Paisley, Bentley and Jimmy Wayne all performed “Alcohol” together. I’ll be there at Shoreline Amphitheater tonight! Looking for the KRTY booth! Will you? It should be an awesome show as always with these guys. I’ve never seen Jimmy Wayne but heard that all three will impress. Been to a lot of good shows so far this year: Kenny Chesney, Toby Keith, Trailer Choir, Lonestar, Chris Cagle, Lady Antebellum etc…This should rank right up there with them!